C. Jackson “Jack” Grayson spent his entire professional career applying quality thinking and methods to help improve organizations and society. Jack founded APQC in 1977 and worked tirelessly until his retirement in 2015, just shy of his 92nd birthday. He had a bachelor's degree from Tulane University, an MBA from the Wharton School of Business at the University of Pennsylvania, and a doctorate in business from the Harvard Business School. His academic career included professorships at Harvard, Stanford, Tulane, and Southern Methodist University (SMU), and he taught in business schools in France and Switzerland. He also served as dean of two business schools—Tulane University and SMU. He became known for implementing innovations in business education at both institutions. Jack became most widely known in 1971 when he was appointed to a U.S. Cabinet position during the period of price-wage controls. He served as chairman of the United States Price Commission, under President Richard Nixon. Though controls were not widely accepted, Jack was accorded national recognition by the press, business people, and labor for his fair and firm administration of the controls and for his work in helping remove them. During his experience with controls, Jack became aware of how important productivity was to the economic well-being of the nation, how American productivity growth had begun to slow, and the rising competition from abroad. He was one of the first people in the nation to sound the alarm about our sagging productivity, quality, and competitiveness. After he left Washington, Jack returned to the private sector and founded the nonprofit APQC (American Productivity & Quality Center) in Houston, Texas. It was his answer to a dangerous economy—it was an initiative that would help improve American competitiveness. In 1990, Business Week said of Jack, “Few, if any, individual Americans have done more during the last 20 years to shape the country’s economic future for the better.” The story behind that statement is the history of APQC. In 1997, at the age of 74, Jack and APQC launched an effort to help the education sector restructure and improve student achievement and system performance, drawing on the methodologies learned over the organization’s 20-year existence. The APQC Education Initiative is actively working to transform U.S. public K–12 education using process management. Jack was a Certified Public Accountant and a member of the boards of directors of eight major U.S. corporations. He was named in 2000 as one of the 10 “Most Admired Knowledge Leaders” in North America by Teleos, a British research firm. 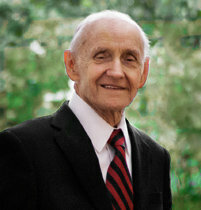 In November 2003, he was named by the American Society of Quality (ASQ), as one of nine “Distinguished Service Medalists.” In 2006 the Cox Business School at SMU created the C. Jackson Grayson Endowed Faculty Innovation Award, for excellence and creativity in teaching, which is awarded each year at SMU. In 2008 APQC and ASQ established the C. Jackson Grayson Distinguished Quality Pioneer Medal to honor individuals who have demonstrated leadership in quality areas in education, health care, public sector, and not-for-profit organizations. In 2016 he was inducted into the Hall of Fame by the Association for Manufacturing Excellence (AME). According to Grayson, of the honors bestowed on him over the years, he was most moved by the APQC-driven tributes. In 2015 APQC launched Founder’s Day, an annual celebration to honor Jack Grayson and the work of APQC. During the inaugural event, APQC renamed its amphitheater to be Grayson Hall—“dedicated to all those who come to APQC to learn, adapt, and improve their organizations and named in honor of our Founder Jack Grayson, who inspires and challenges every individual to reinvent their future every day.” In 2016 APQC introduced the Grayson GuaranteeSM, a defining guide for APQC and its team on how to live, work, and act with Grayson’s values at the forefront of every decision. Jack was the author of about 50 magazine and newspaper articles and four books. The latest was co-authored by Carla O'Dell and is titled If Only We Knew What We Know, a book about knowledge management and the internal transfer of best practices. A biography of his life, Freedom to Dream, Courage to Act: The First Nine Decades of C. Jackson Grayson, was released in 2014 in celebration of his 91st birthday. Jack's career, however, was not confined to just business. He believed in variety, constant learning, experimentation, and fun. His career included being a newspaper reporter in New Orleans, a Special Agent of the FBI, a manager of a cotton farm in North Louisiana, and a member of an export-import firm. He was also a single-engine airplane pilot. He went sky-diving (on his 75th and 90th birthday! ), owned race horses, and visited all seven world continents. He even danced with Vivien Leigh at the gala premiere of “Gone With the Wind” in Atlanta when he was a student at Georgia Military Academy. While Jack planned to live until he was at least 113—and pause then for replacement with spare body parts, he passed away peacefully on May 4, 2017 at the age of 93. He obviously believed in Self Renewal, a book by John Gardner that he read regularly.